representing Ghana at the Chess Olympiad in Istanbul. Received an announcement from Kwadwo Bonsu that Ghana will be holding its national championship beginning on the 22nd. There are a list of invitees below including the defending champion and Olympian, Kojo Hasford. Details are forthcoming as they become available. The following players are to confirm their availability by the extended date of 7th Dec 2012 to take part in the championship. 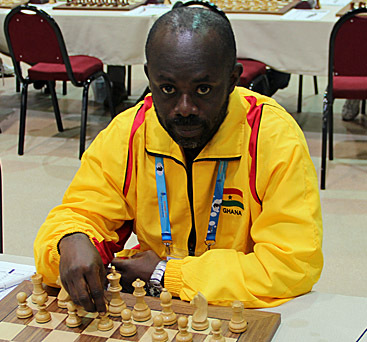 Francis Anquandah won the Ghanaian Championship with 7½/9. Following was the reigning champion John Kojo Hasford and fellow Olympiad teammate Edward Thompson with 7/9.